A warm welcome is extended to you to join our small but friendly congregation at our weekly services. An invitation to anyone passing by when the Chapel is open; please do call in and remember to sign the Visitors Book. These take place at 10.30 am each Sunday. They last about an hour followed by refreshments. On the last Sunday in the month Contemporary Worhship offering "something different" such as cafe-style worship in the adjorning school-room. On the First Sunday in month, at Kirkbampton School during term time. Other arrangements may apply during school holidays. Everyone from the very young to the not so young is welcome to join in worship with a difference; live band, singing, praise and prayer, different worship zones, refreshments, all in about an hour or so. Monthly Mid-week Informal Worship for All. On the Tuesday following 1st Sunday in month at 7.15 pm. During winter months (Oct -Mar) in the school-romm; summer months (Apr - Sep) at St. Mary's Church. A short act of worship with friends from St Mary's Church, Beaumont followed by refreshments & an informal discussion on a set theme. Taking place on the first Wednesday in month, at 7.30pm at Thurstonfield Methodist Church. An opportunity for all Churches and Church Groups in our area to pray together. The Church is open daily from 8 am to 7 pm, as indicated by the A-board placed outside. Please enter and look around and remember to sign the Visitors Book before you leave. If Church is closed please contact a Church Steward. Our Churches Quiz Quiz sheets in the Porch based on questions about Monkhill Methodist & St Mary’s Beaumont. Answers can be posted in the Entry Box in either Church. Small prize for taking part. Open to all - Church members, parishioners, friends. Join us for a hot two-course lunch with tea/coffee in the school-room at Monkhill Church on the last Thursday of each month. Doors open at 12 noon. Lunch served at 12.30 prompt. Open to all. No set fee but donations are invited to defray costs. Come and enjoy a home-cooked lunch. No booking required. 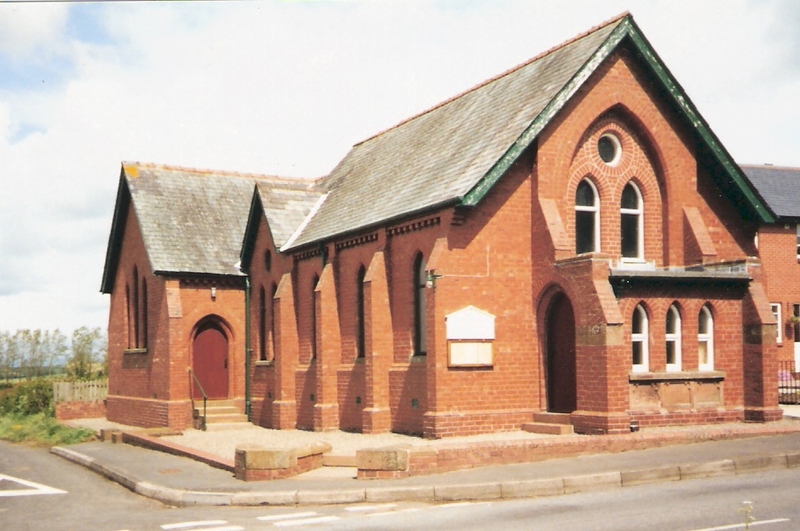 Monkhill Methodist Chapel. Photograph taken in 2001. The Carlisle (Wesleyan) Circuit Schedule Book for 1838 shows that there was a 7-member Methodist society at Burgh-by-Sands. Services were held mainly in members’ houses and led by local preachers and occasionally travelling preachers from Carlisle. By 1841 the society was known as Burgh & Kirkandrews, and by 1846 became known simply as Kirkandrews. By 1851 the membership had increased to 17. Encouraged by this increase it was felt that a permanent chapel should be built. By 28 October 1853 the land in Monkhill was obtained for the sum of £5. On 20 May 1858 the foundation stones were laid and the Chapel was opened later in the year. The name was changed from Kirkandrews to Monkhill. No photographs or drawings of this Chapel have survived but from various accounts it was a simple building enclosed by a stone wall and seating for 75 worshippers. This building ultimately became too small and by August 1903, a gift had already been made of a site adjoining the present Chapel and it was decided to build a new chapel at a cost of £700. It was planned that the new Chapel would seat 120 worshippers with an adjoining schoolroom, a vestry and storeroom. The foundation stones of the new Chapel and schoolroom were laid on 19 May 1904 The event was well recorded in the local press. Monkhill Chapel is part of the "Rural group of Churches" of North Cumbria consisting of Wetheral. Cotehill, Dalston, Thursby, Thurstonfield, Monkhill and Solway Chapels. Click here to view a history of the Chapel. Click here to view the Methodist Calling. The School Room adjorns Monkhill Methodist Chapel. See the Monkhill School Room Page for more details.